What is the difference between iPads and tablets? The iPad is a tablet manufactured by Apple; the iPad runs an iOS operating system also developed by Apple. Other tablets are made by various different manufacturers and run an Android OS developed by Google. Finally, there also are Windows tablets manufactured by Microsoft and running a Windows operating system. The operating system is the most important difference between iPads and tablets. The Apple’s iOS is quite different from Android and Windows – it looks different, works different and has its own pros and cons. The iPad’s OS is more intuitive even for non-technical users; however, it is more closed and proprietary. Just like Windows, Apple is a proprietary and closed-source ecosystem. Many open-source software developers complain that Apple builds its products using the best open-source technology, then closes them off. Owners of iPads can only use iTunes software for new apps. They cannot use a standard USB cable to charge their iPad, only the Apple charger that fits the unique charging port. Products by Apple are tied together and work well together, but any third-party alternatives are excluded. The situation is similar with Microsoft and Windows tablets – they are also quite proprietary. Android OS tablets in comparison offer a lot more options and alternatives. Even though Google’s android is not “entirely open”, it is much more open than iPad’s iOS. Android is based on the Android Open Source Project (AOSP). People can create custom operating systems from AOSP, such as CyanogenMod and even Amazon’s Fire OS. Apple’s iOS is closed-source. here’s no possibility of making a new OS from it. Most important difference between iPads and tablets in this regard is that apps on Android can come from anywhere – all you need to do is allow your tablet to install apps from “unknown sources” – this means sources other than the Google Play app store. On iOS, Apple’s App Store is the only place you can install applications from. If Apple doesn’t approve an app, you can’t use it. “Sideloading” such apps is a headache – first you need to perform a very complex jailbreaking of the device. On Android tablets, you can totally change your home screen, place widgets all over, install a third-party launcher, etc. Not so in iPads – Apple doesn’t allow you choose a default web browser, mapping app, email client, and other default apps. An essential difference between iPads and tablets is the price. iPads generally cost at least twice more than a comparable tablet. For example, the Apple iPad Air 10-Inch 16GB tablet is listed on Amazon at $284, while the HP 10 G2 2301 10 inch 16GB tablet is listed at $115 and the NeuTab® 10.1 inch 16GB tables sells at $100. You can buy two such tablets for the cost of one iPad. Since tablets are manufactured by different companies and have varying specs, the prices vary by a lot. The 10 inch Samsung Galaxy Tab (16 GB ) is now $230 on Amazon, while the smaller Fire Tablet, 7″, 8GB is only $49.99. The manufacturers of tablets you can choose from include – Acer, Asus, Amazon, Samsung, Sony, Toshiba, Lenovo, LG and others. iPads generally have higher screen resolution than an average tablet. For example, the Apple iPad Air we mentioned above has a 2048 x 1536 pixels resolution. The other three 10-inch tablets mentioned above have only 1280×800 pixels resolution. Weight, Dimensions, Battery Life, etc. It is hard to compare the iPad versus other tablets in weight, color and other similar specifications, because there are just too many different tablets with all different specifications. For example, some tablets have a shorter battery life than iPads, others – longer. Same with other specs. The tablet market is just too diverse – there are tablets for all tastes. 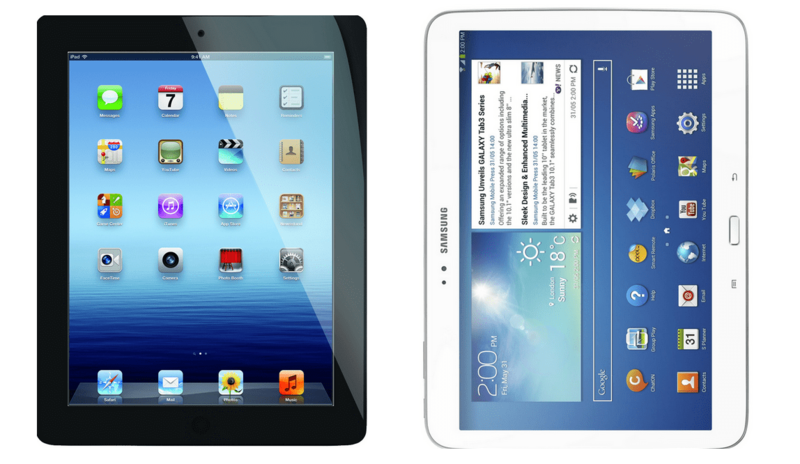 Now that you know the major differences between iPads and tablets, the next question is which tablet to buy? The iPad and other tablets are very similar in what they enable you to do. You can surf the Internet, watch videos, listen to music, read ebooks, play games, and check email with all of them. They all have lots of apps to explore: the iPad and Android tablets have about 1.5 million apps; the Windows Phone Store has about 340,000 apps and Amazon Appstore – about 400,000. Compared to Android tablets, the iPad is easier to get the hang of initially. The intuitive interface is easy even for non-technical users. Apple approves each app prior to its release into their store for sale. However, iPad tablets are limited in customization; multitasking is absent; some useful apps never pass approval; card slot is absent so you cannot expand iPads storage capacity via micro-SD cards. Finally, the iPad is more expensive than other tablets. Android tablets are a wide range of products both premier and lesser-known brands. They offer the ability to customize the appearance any way you like; you can download apps from all different sources; multitasking is available – multiple apps can run at the same time. Android tablets are significantly cheaper than Apple iPad. However, in the beginning Android is less intuitive than Apple’s iOS to use. What about the Microsoft’s Windows tablets? They are compatible with Microsoft Office and are a good choice for work use. The cheap Amazon Fire tablets are good media devices, but functionality is limited compared to iPads and ordinary Android tablets. What other important difference between iPads and tablets did we forget to mention? Please comment.